Board members and staff of the Louisiana Emergency Response Networkwatched and listened in horror to the breaking news coverage of the recent shooting rampage that erupted on a community baseball field in Virginia, which critically injured Louisiana Congressman Steve Scalise. The LERN family extends our best wishes for a full recovery to Congressman Scalise. First, Congressman Scalise received almost immediate first aid care, from medical professionals who were coincidentally at the ballpark, which limited his blood loss. Second, Congressman Scalise was taken by EMS directly to a Level I Trauma Center, where a comprehensive team of trauma specialists could immediately assess his injuries and initiate lifesaving care. A trauma center can handle all of the same types of illnesses and injuries that are seen in an Emergency Department, but they are designed to handle the extreme cases where there is an issue of immediate survival. They take care of sickest patients. Examples of traumatic injuries include those sustained in high impact automobile accidents, gunshot wounds, and falls. The trauma center extends outside the walls of the ED and must provide care from prevention to injury and then rehabilitation. Level I and II trauma centers need to have trauma surgeons, neurosurgeons, facial surgeons, spine surgeons, critical care surgeons and many other specialties on staff and immediately available 24 hours a day, 7 days a week. In Louisiana, these centers are verified every three years by the American College of Surgeons to ensure their high standards are being met. LERN can proudly report a total of five Level I and Level II trauma centers in Louisiana today. 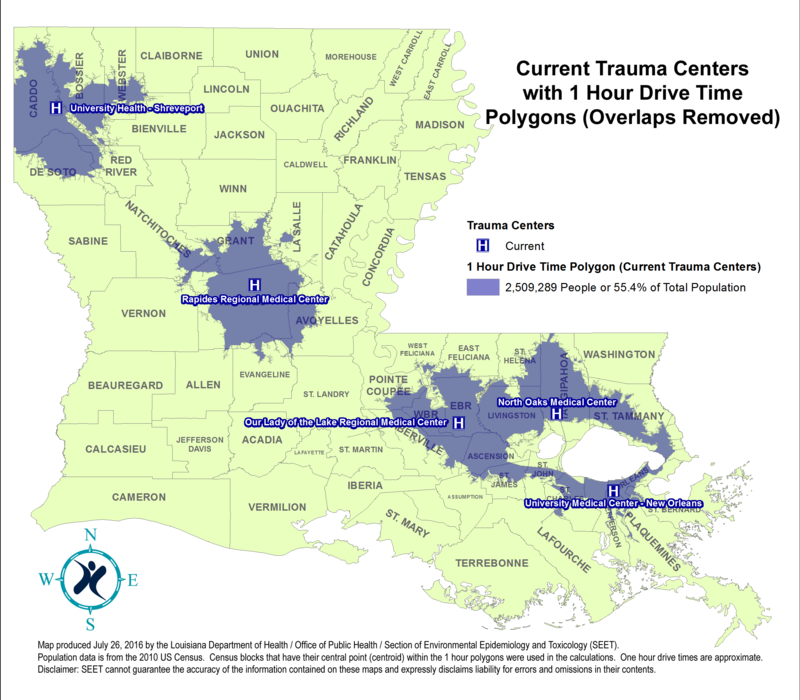 These trauma centers, located in Alexandria, Baton Rouge, Hammond, New Orleans, and Shreveport, have the resources to address severe traumatic injuries. Additionally, formal efforts to establish trauma centers in Lafayette and Lake Charles are underway and there are Level III Trauma Centers being developed on the Northshore. LERN is also promoting the national STOP THE BLEED campaign – an initiative to provide bystanders of emergency situations with the tools and knowledge to stop life-threatening bleeding. There are simple steps that can be taken by bystanders in an emergency situation to stop or slow life-threatening bleeding which can save lives. Recognizing the importance of “stopping the bleed,” LERN partnered with University Medical Center New Orleans, to educate and equip law enforcement with tourniquets. Since 2016, together we have provided education and tourniquets to 474 law enforcement officers across the state. For more information on these efforts and how you can get involved in the STOP THE BLEED campaign. The American College of Surgeons Committee on Trauma, a partner in the STOP THE BLEED campaign, has also developed a series of training resources available online here. This campaign includes expanding personal and public access to Bleeding Control Kits which can be the difference between life and death for an injured patient. LERN is currently developing a Louisiana plan to fully leverage the STOP THE BLEED resources and promote wide distribution of Bleeding Control Kits. The Louisiana Emergency Response Network (LERN) is an agency of state government created by the Louisiana Legislature in 2004 charged with the responsibility of developing and maintaining a statewide system of care coordination for patients suddenly stricken by serious traumatic injury or time-sensitive illness (such as heart attack and stroke). It is a system also designated to serve as a vital healthcare resource in the face of larger scale emergencies and natural disaster. 0 Response to "Congressional Ballpark Shooting Demonstrates the Value of Trauma Care in Communities"